FILE - In this April 3, 2015 photo, rescued Burmese fishermen raise their hands as they are asked who among them wants to go home at the compound of Pusaka Benjina Resources fishing company in Benjina, Aru Islands, Indonesia. Two Indonesians and five Thai were arrested on charges of human trafficking connected with slavery in the seafood industry, Indonesian police said on May 12. Among the countries it singles out in the Global Slavery Index as taking the least action to combat slavery are North Korea, Iran, Eritrea, Central African Republic, Democratic Republic of Congo and South Sudan. Slavery conditions can include forced labor, including forced labor in prisons; commercial sexual exploitation; and forced marriage for women. Many of those enslaved are working under forced labor conditions to make clothing that is exported globally, says Walk Free's executive director Fiona David, adding that consumers who buy those products may be contributing to the problem. David told VOA: "The surveys in Bangladesh showed an estimated 1.5 million people being held in some form of forced labor. And, of course, Bangladesh is our largest source of ready-made clothing for consumers around the world. So this really has implications for everyday people in terms of what clothing they buy and sell. The same can be said for Cambodia." Even the making of cheap fabric can contribute to global slavery numbers. 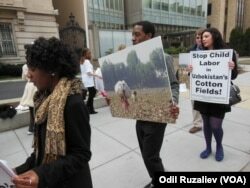 Uzbekistan, for instance, subjects its citizens to forced labor in its annual cotton harvest. That fact has particular resonance in the United States, where African slaves two centuries ago were forced to labor in cotton fields in the American South, before such slavery was outlawed. Human Rights Watch spokesman Wolfgang Buetner spoke to the Associated Press on the issue Tuesday. "This is a problem in Bangladesh, where a lot of textile workers are working, but also in India and other countries in Southeast Asia. What is important is that the companies also live up to their responsibilities and that they check on [whether] the subcontractors comply with labor law standards." Wealthier countries generally had lower slavery rates — the top 12 countries with the lowest rates of slavery are Western European, the U.S. and Canada, and Australia and New Zealand.